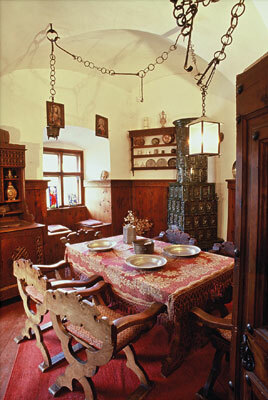 In addition to these tours, visitors are welcome to attend the Südtiroler Burgeninstitut's other offerings like seasonal exhibitions in the dungeon and the occasional cultural event. We also invite you to the refreshments and ambiance of the castle's bar. Visitors bringing their dogs with them can leave them in the provided "dog boxes" while on tour. Exception: The 24th December the castle is closed in the afternoon and the 25th December and 1st January the castle is closed in the morning. everyday (also Mondays) at 10.00, 10.30, 11.10, 11.45, 12.15 a.m. and at 1.15, 2.00, 2.35, 3.15, 3.50, 4.30 and 5.00 p.m.
everyday at 10.00, 11.10, 12.15 a.m. and at 1.15, 2.00, 3.15 and 4.30 p.m. Please note that all information are without guarantees and is subject to change. Changes are possible. Taufers Castle is accessible from the village of Sand in Taufers in the Taufers Ahrn Valley (Tauferer Ahrntal), 13km north of Bruneck. For a short, easy going walk, there is a footpath. The castle can also be reached by car via a clearly marked forest road just a kilometer north of Sand in Taufers, branching off of route SS621 (Sand in Taufers-Prettau). Parkinglocations at the castle are limited.